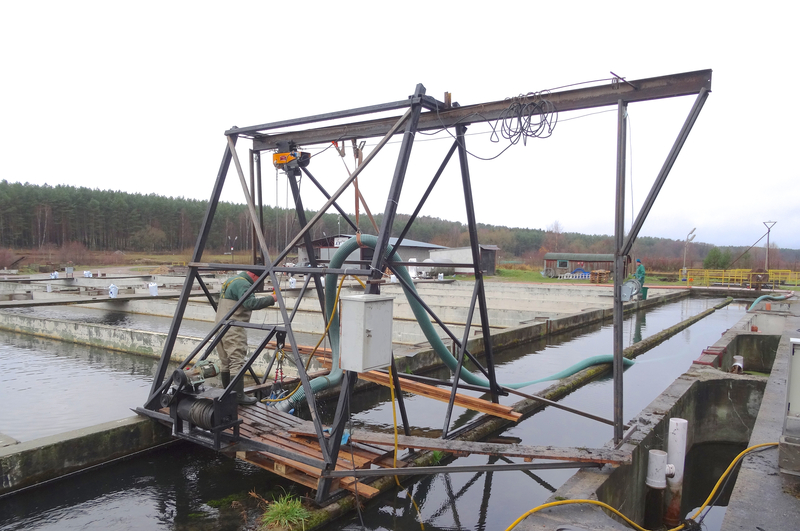 For the operators of the Aquamar fish farm in the Polish town of Miastkowar, one of the country's largest, dredging the sludgy system channels with their sediment and organic substances was a constant nuisance: The operation swallowed up around 18,000 euros each year. Excavator hire was not the only cause. The negative effect of the operating process during was increasingly causing a strain. Impressed by the technology demonstrated by the market's leading manufacturer of drainage contractors' pumps, Tsurumi, at exhibitions, Managing Director Andrzej Marczyński weighed up a bold step. A GPN622 type heavy-duty sand pump should keep the channel open in future. The sales and service partner, BBA Pumps in Piaseczno, delivered the 415 kg unit within just a few days from stock. Aquamar operates the pump hanging from an A-support frame, which they promptly produced internally. The entire structure was installed in the water collection area. A flexible hose channels the drawn mixture to nearby sedimentation tanks or pits. This is where the dredged material was also moved to previously. The pump is not operated constantly but at intervals as required. The outcome after just over one year is quite astounding: Aquamar has not only covered the procurement price of the pump. In fact, this solution also saves thousands of euros in costs every single year. Application scenarios like this one are not unusual for the Japanese pump manufacturer with its European headquarters in Düsseldorf: Lots of contractors and operators of pebble and sand pits would proceed in the same way. The GPN series of pumps with the spiral-shaped housing has been developed for such purposes. They provide plenty of power with a maximum capacity of 5000 l/min and a 30 m head, depending on the model. Thanks to hard materials that are very resistant to abrasion, the GPN can take a lot. It even manages very well with viscous media: A powerful agitator on the shaft makes this possible.